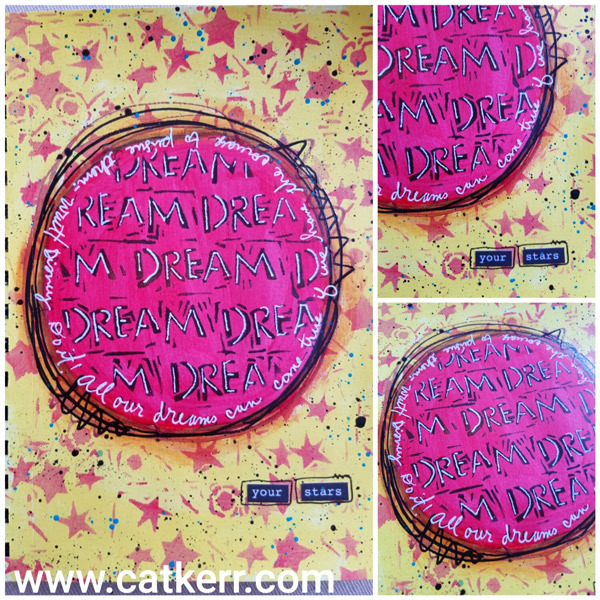 Our newest stencil designer is artist Cat Kerr. She loves "messy, textured backgrounds" and her stencil designs evoke hand-carved shapes in wood. 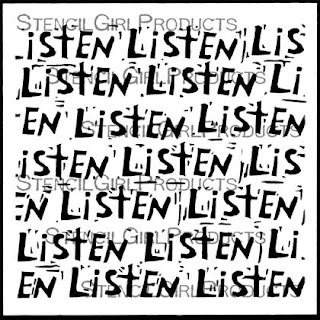 All 6 stencils are 6" x 6". 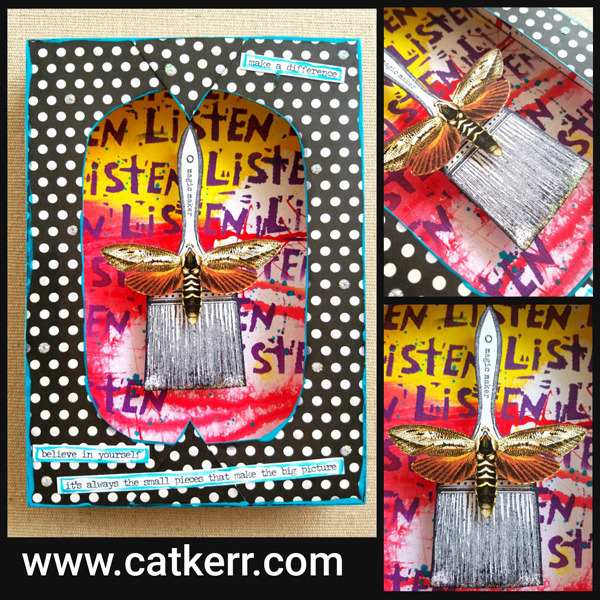 Because words are often a part of Cat's personal artwork, her Hand Carved Designs includes stencils with the words Seek and Listen. 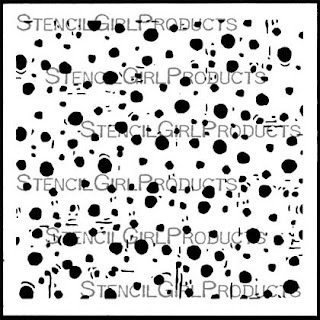 Cat intends that repetitive pattern in these stencils offers the user the option to include the entire stencil or just a portion, but either way get the impact of the design. 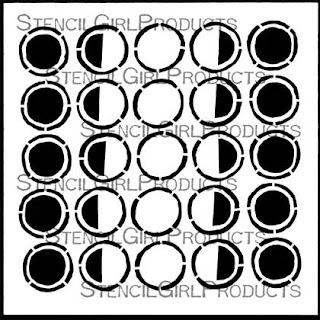 Organized Chaos, Carved Moon Phases, and Starlight, Starbright are the 3 pattern-only stencil in this collection. 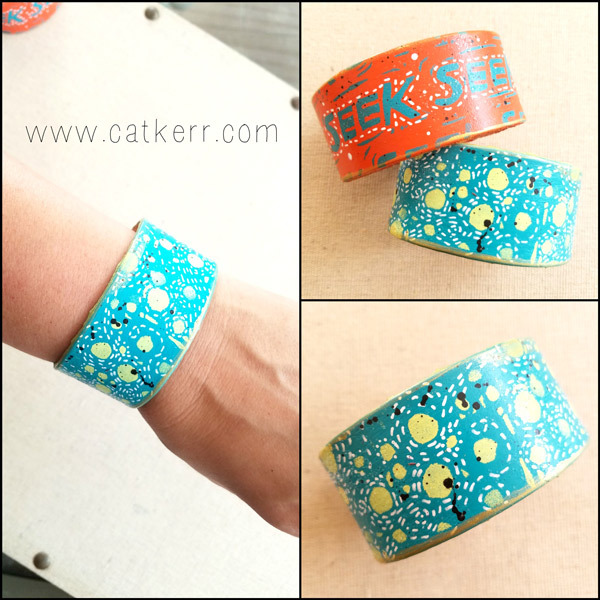 Inspired by Vincent Van Gogh's "The Starry Night" Cat Kerr's pattern stencils "Organized Chaos" and "Starlight, Starbright" are designed to evoke the same topsy-turvy feeling and they round out her Hand Carved Collection. 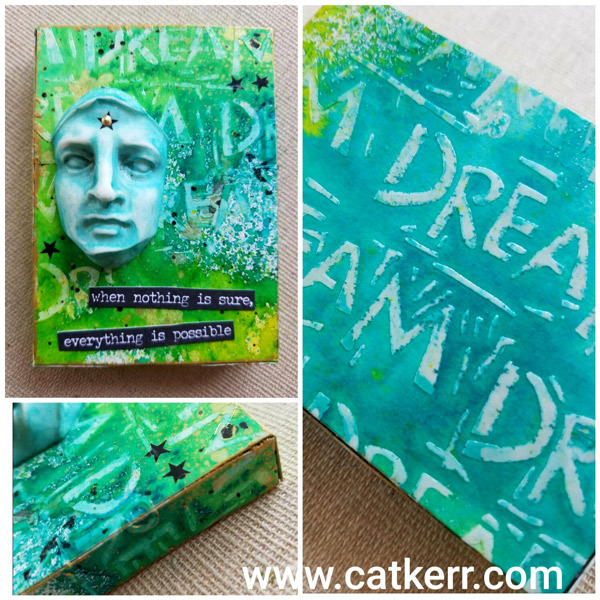 Cat created these ATC cards by applying this technique on to a full sheet of mixed media paper. She cut it up later and mounted it on to a ATC chipboard blank. 1. 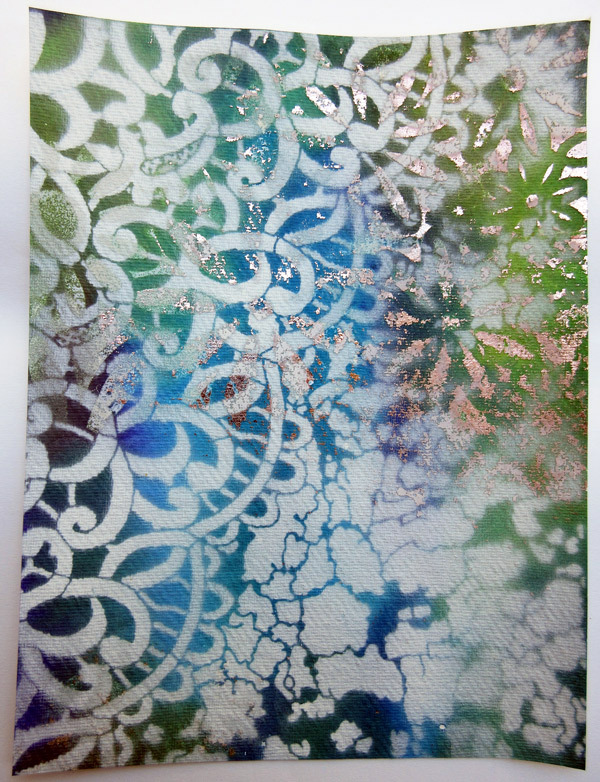 Use a palette knife to pick up crackle paste and slide it across the stencil. Cover about half of the paper. Let the crackle medium dry. Wash your knife and stencil. 2. 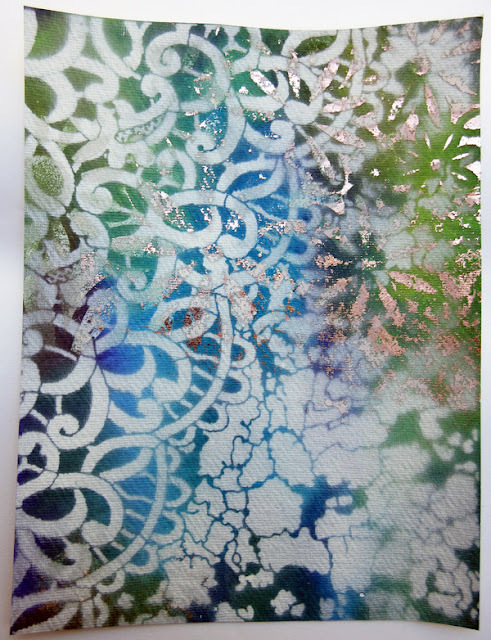 Spray the crackle with assorted colors of Prima Color Bloom shimmer spray and let it run down your page. Allow each layer to dry before adding another color. 3. Cut the paper into assorted sizes. 4. Using a glue stick, add some paper to a Retro Cafe Art ATC base. Add some interest by gluing on some of the stencil design and some of the drips made in the process. 5. Add splatters of watered down black paint. 6. 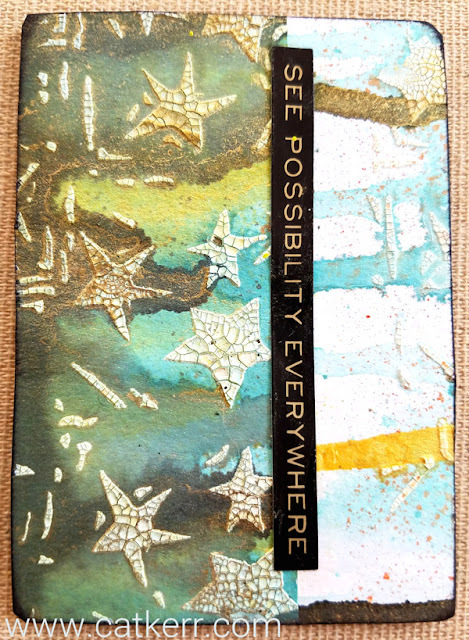 Add ink to the edges of the ATC. 7. Finish off with a word sticker or flower design. 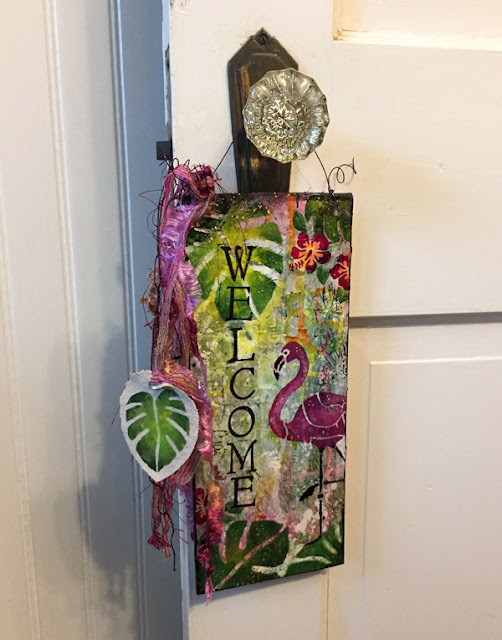 You can catch up with Cat on her blog ~ she has made a special video, so be sure to check it out, especially if you love to adorn yourself! 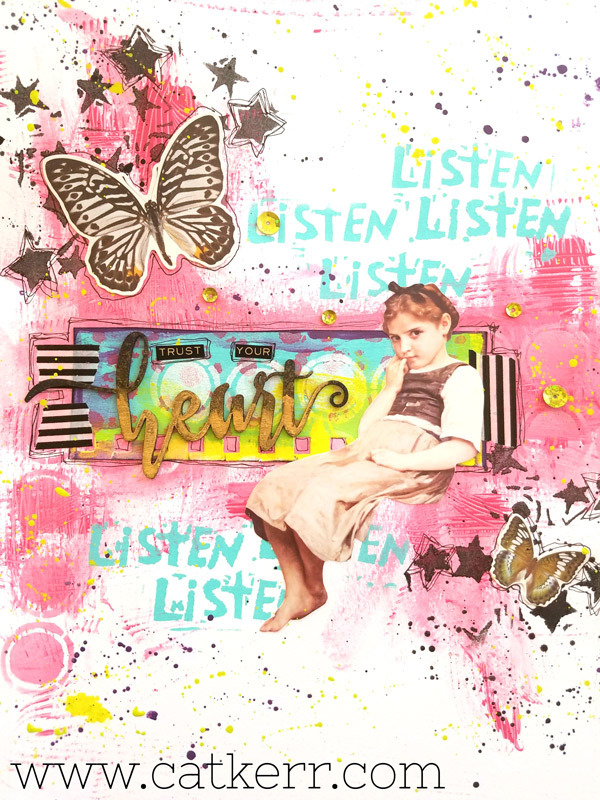 You can also learn more about her on her StencilGirl Artist Page. 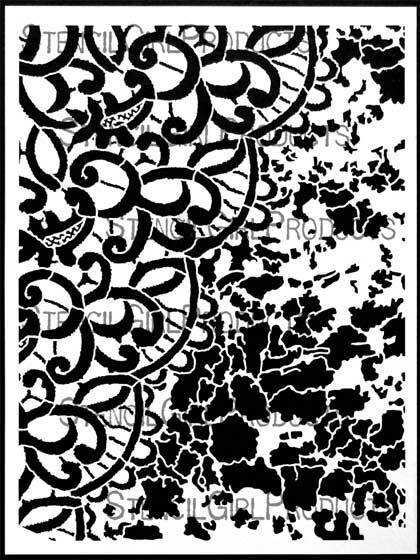 Jane LaFazio had the lace and tiles of a bygone era in mind when she designed her Lace and Patina stencil. 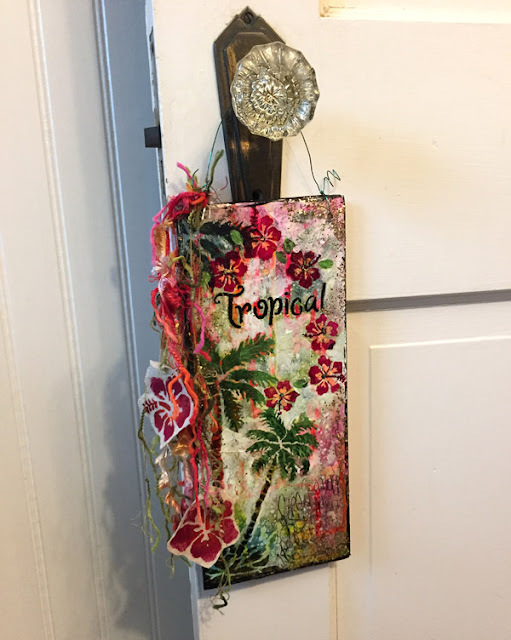 It was inspired by her visit to Ernest Hemingway's villa. 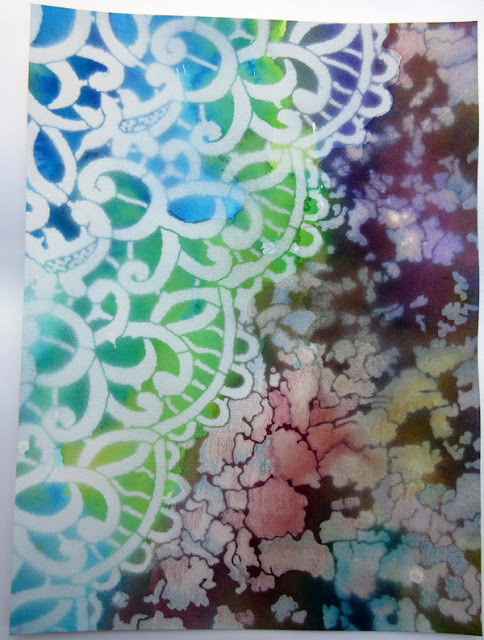 She used dye-based watercolors on watercolor paper on both pages. This collage sheet has foil on it as well. 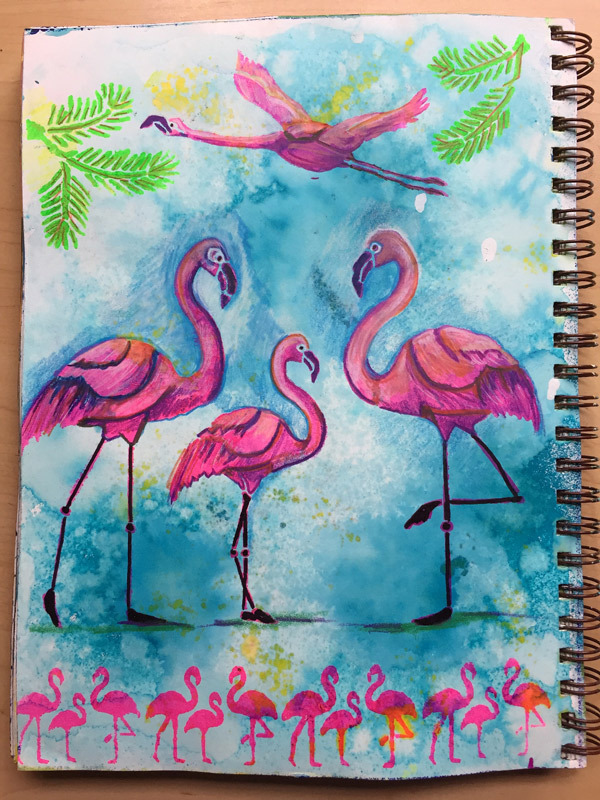 The sights, scents and sounds of a tropical summer inspired June to design her Tropical and Flamingo stencils. 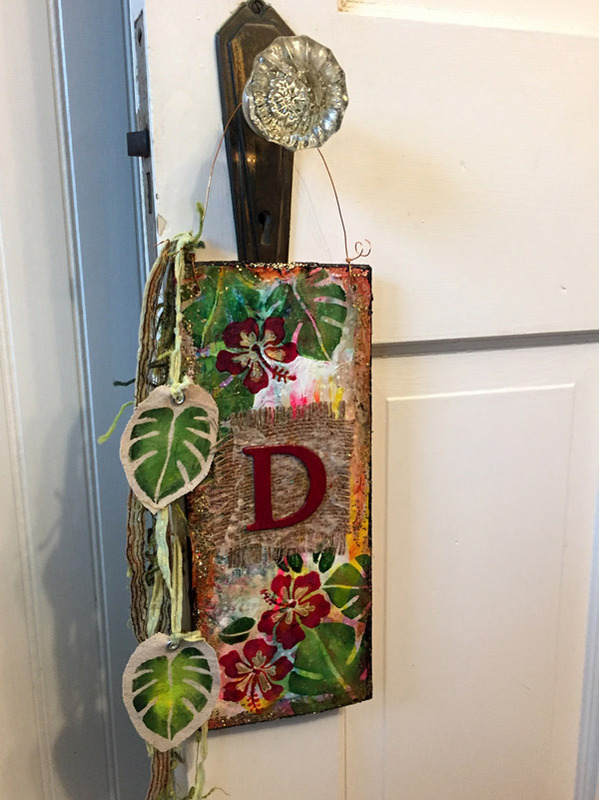 Here she has made sunny additions to the doors in her home. What a welcoming way to greet a guest! 1. 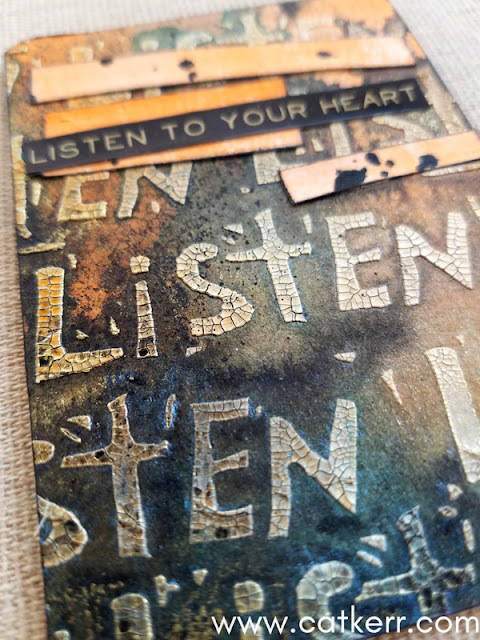 Using plywood cut to 4-1/2” x 10-1/2”, collage a variety of papers including dictionary text, handmade paper and maps with matte medium. 2. After the first layer is dry, paint over boards with white acrylic paint allowing for some transparency. Let dry. 3. Spray various colors of Dylusions ink. Let dry. 4. Seal with matte medium. Let dry. 5. 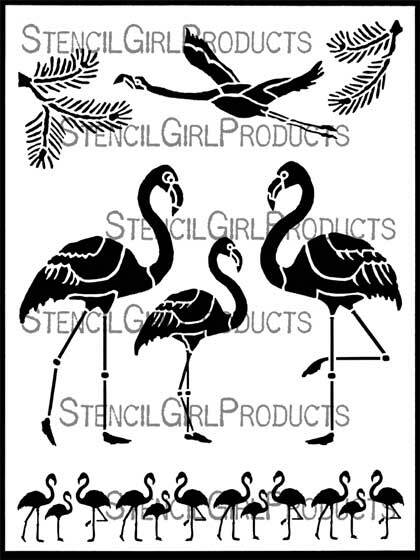 Using the Tropical and Flamingo stencils, stencil design with various colors of acrylic paint. Add letter stamps as desired. 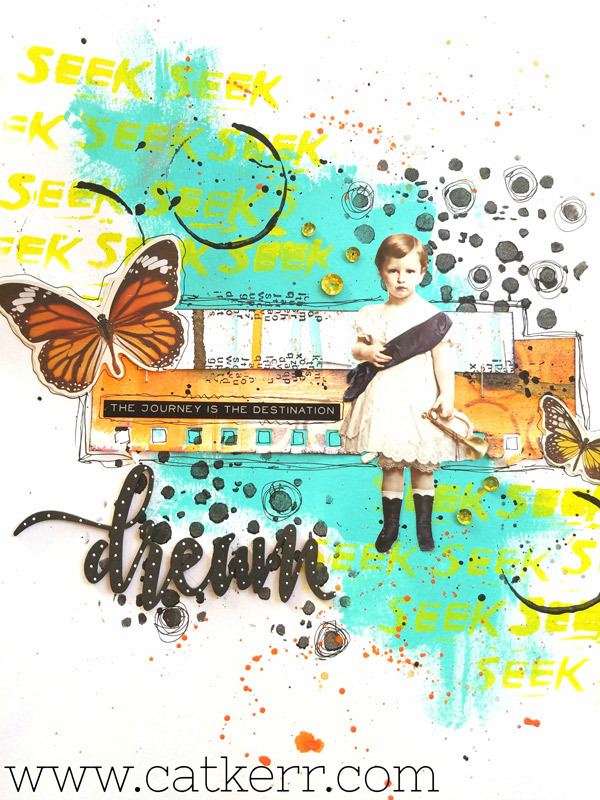 Use Gelly Roll pens for details. Spray with sealer. 6. Once dry, drill holes in top corners of each piece. Attach colored wire for hanging. Add fibers. 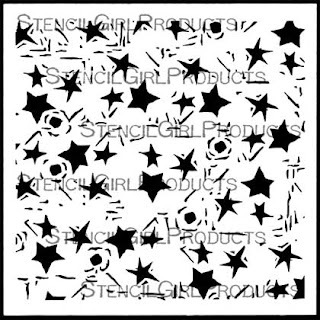 For fabric tags, stencil on fabric. Use fabric scissors to cut out each design. Add an eyelet. Attach to fibers on side of each piece. You are surely ready for a dreamy summer day or a starry night with these stencils from Jane LaFazio and June Pfaff Daley, as well as out new designer, Cat Kerr. 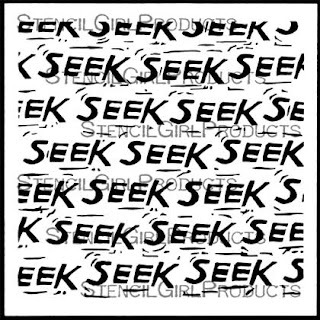 Which stencils will you seek? 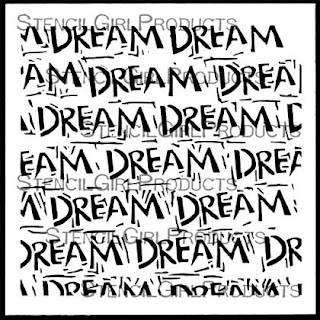 So honored,thrilled,overjoyed to be part of the Stencilgirl family!! 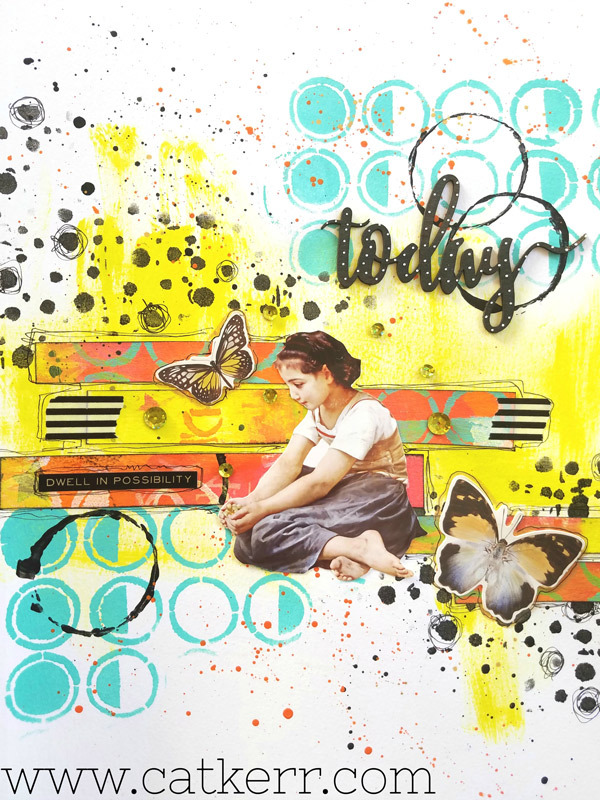 and I Love Jane and Junes beautiful new stencils! Welcome Cat! 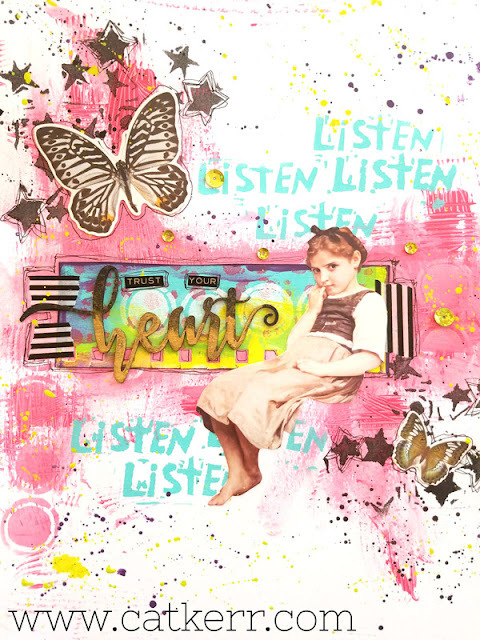 Your stencils and projects are awesome. I love your style! Thank you so much June! Honored to be here!! Oh wow -- what a truckload of fantastic and exciting projects; every one of them makes perfect use of these new stencils! 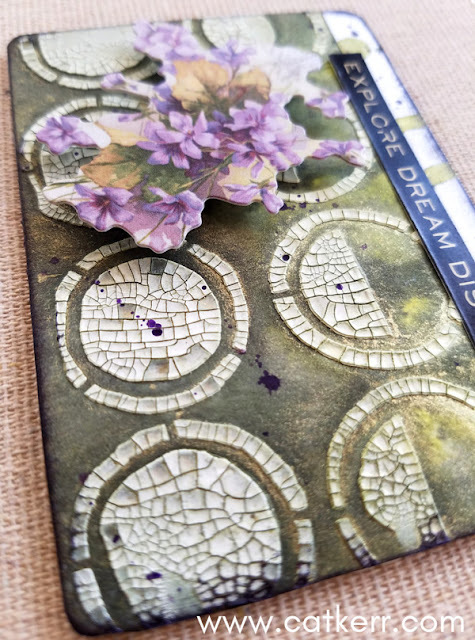 If I were forced to pick my personal favorite, it would be the combination of lace and patina -- hugely creative, to play this pair of elements against one another! Ohmygosh!! 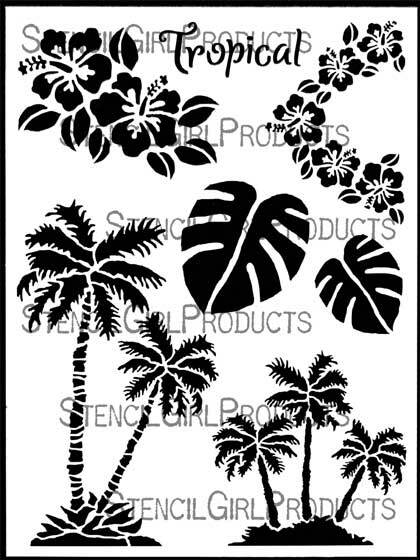 What awesome stencils!! All of them are perfect and the projects are beautiful! All of these are awesome, huge congrats to Art Sista Cat! Love you girl. Thank you so much Sista!! Love ya back!! Thank you so much Carole!! Congratulations! Love all the stencils. I think the flamingos is my fav!